Macedonia is landlocked country, surrounded by Albania, Kosovo, Serbia, Bulgaria and Greece, and lies on the borders between many cultures. Although the country is rooted in its traditions, it is also a forward-looking country that has accepted and embraced its cultural and ethnical diversity and is becoming integrated within the European political and economic institutions. Macedonia is a place where hospitality, coming from the heart, always welcomes visitors, and the country whose charms have not been lost. Easily accessible from all points abroad, and boasting all the comforts of the Western world, Macedonia provides the best of age-old traditions, historical and cultural treasures, and a pristine beauty and natural environment. Macedonia is a country of national parks, ancient monuments, variety of religious buildings and unique culture, offering an abundance of interesting natural attractions, from mountains, rivers and lakes to water falls and thermal spas, from wide fields to weird rock formations. Besides the natural beauty, the touristic attraction of the country are numerous archaeological sites old for millennia, and well protected ancient religious buildings, such as churches, monasteries and mosques. 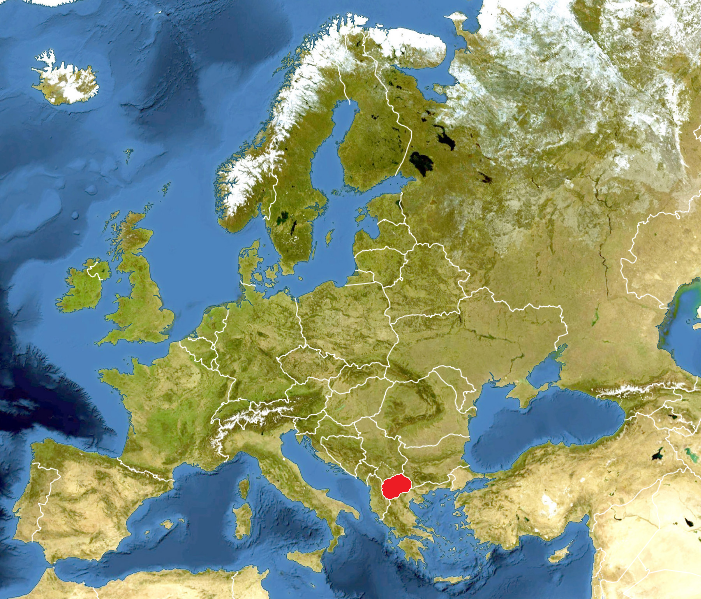 The Republic of Macedonia is situated in the central part of the Balkan Peninsula, with an area of 25,713 square kilometres bordering on Serbia to the north-east, Kosovo to the north-west, Bulgaria to the east, Greece to the south and Albania to the west. Due to such a geographic location, Macedonia is, and has been, an important crossroads of many different civilisations, religions and cultures throughout the history. Macedonia gained its independence peacefully from Yugoslavia in 1991. Skopje, the capital of the Republic of Macedonia, is the biggest political, economical, educational and cultural centre. The other bigger towns in the country are Kumanovo, Stip, Tetovo, Veles, Prilep, Bitola, Ohrid etc. According to the last census in Macedonia live around 2.1 million people, while the population of Skopje is more than 500,000. Broken down into nationalities population gives 64.2% Macedonians, around 25.2% Albanians, and 3.9% Turks; the rest are other minorities and ethnic groups. Blending Slavic, Albanian, Turkish, and Mediterranean influences, the country has quite a mix of architectural and ethnic heritage that are appealing to most visitors.Macedonia is predominantly a mountainous country with great number of exceptional natural treasures and beauties. In Macedonia there are 14 peaks which are rising to over 2,000 metres. The mountains and mountain ranges are hatched by many valleys, ravines and plains. Vardar is the longest and the most significant river in Macedonia, dividing the territory into eastern and western part. The total length of Vardar is 388 km, and to Macedonia it generously gives 301 km in its valley, before emptying into the Aegean Sea in the gulf of Thessaloniki, in Greece. The influences of the Mediterranean and the Continental Climate positively affect the high fertility of the cultivated land and the development of cattle breeding as well as the development of winter and also summer tourism. Macedonia is a country of lakes of extraordinary natural beauty that offer favourable conditions for the development of tourism. In its southern part there are three large tectonic lakes: Ohrid, Prespa and Dojran. Their outstanding natural environment and numerous recreation facilities make them recognised tourist centres. On its territory there are 3 national parks, 15 natural reserves and 25 glacial lakes situated in the highest parts of mountain massifs formed during the Ice Age. The winter sport centres: Popova Shapka, Bistra-Mavrovo, Krushevo, Pelister, and Golak, with their picturesque terrains suitable for winter sports, are very famous. In essence, today’s Macedonia is a unique blend of cultures, religions and nations that have co-existed for thousands of years. Macedonia’s cultural richness is expressed in its archaeological legacy. Macedonia has very extensive and long history. The large number of archaeological sites gives Macedonia a name – magical land of archaeology. The evidences show that old European civilization flourished in the territory of Macedonia between 7000 and 3500 BC. Macedonia's thousands of years old heritage of different cultures and civilizations starts from Neolithic times through the ancient Macedonian, Roman, Byzantine eras, the time of medieval kingdom of Samoil, Ottoman era of five centuries, and continues to the modern nowadays time.